And how to make money out of it? In a two-sided market like the one for online marketplaces, there are different possible business models. 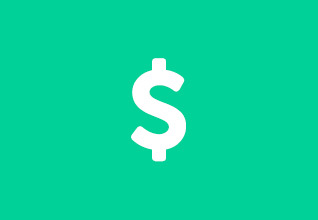 First, you can collect a commission for all transactions. Second, you could look at different fees. Possible are membership fees, listing fees or lead fees. Which one you choose depends on the customers you serve and the products sold. A membership fee is most useful for platforms where several high value transactions are conducted, while payment facilitation is challenging. Listing fees are typical for markets where the seller creates high value from the number of listings and the value of each listing is high as well. Lead fees mean you only pay when you are put in touch with a potential customer. They work best for high value leads with B2C and B2B markets. The last possible business model would be a freemium model with premium offerings for paying customers. Transportation has been and will be an important topic for almost every household. And cars play a major role here. Therefore, one market with lots of customers and sellers is the car market. There is a constant need for buyers and vendors to find each other and to not go through a car seller. For this market, a useful business model is listing fees. Car transactions mostly have a high value and the more listings sellers have, the higher the chances of selling their cars. 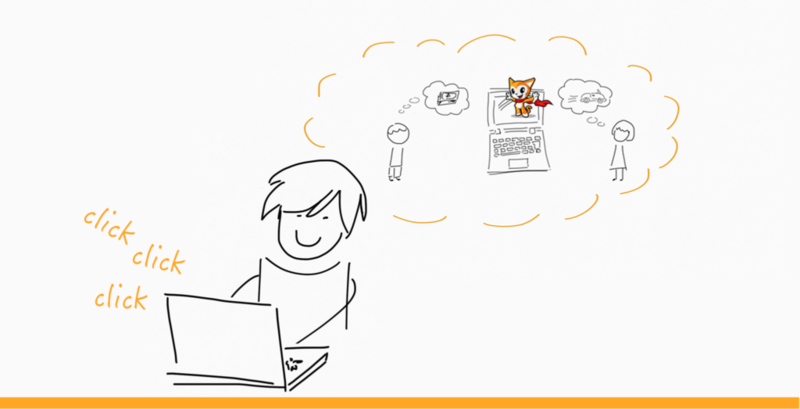 Having an easy and intuitive to use website is crucial for a successful marketplace. Finding a specific model needs to be effortless for customers. At the same time, it has to be easy for sellers to list their cars. 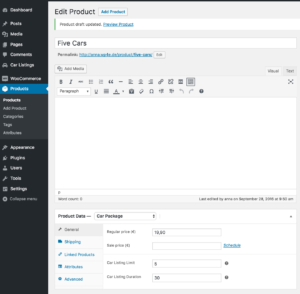 If you are working with WordPress, the WP Car Manager is your solution. And if you know how marketplaces work, setting it up and using it afterwards will be a piece of cake. When installing WP Car Manager for the first time, you will be asked to follow some on-boarding steps. Please do create all three pages needed for the WP Car Manager to work, the Submit Car Page, the Car Dashboard Page and the Car Listings Page. Using the on-boarding screen will immediately connect them with the correct plugins settings. After activating the plugin, you now have a Car Listings menu item. It’s recommended to visit the settings page and click through the settings before starting to use the plugin. All data you enter in WP Car Manager are plain values. This means you won’t add formatting like miles or $ to them. 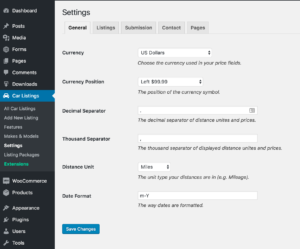 Instead, you define what currency you want to use and if distance is measured in miles or kilometers on the settings page. Other settings are for example deciding if you want sellers to create an account on your website or not. Basically, that’s all you need. If you look at your “Cars” page now, you can already see the form for users to find their dream car. It’s intuitive to use as we all know our way around market places. For users to find the right car easily though, the categories Make and Model are included in the search form. To be able to use them, these have to be predefined. Therefore, go to Car Listings → Makes & Models and fill out what you need. You can easily follow this tutorial. Or you can get the pre-filled Makes and Models extension, so you don’t have to think of all the brands and models yourself. After activating the Paid Listings extension, you will find two main changes in your Car Listings menu. First, you can now find a menu item for Listing Packages. These are the listings sold, basically like the orders in WooCommerce. Second, in you Settings → Submission, there is a new setting to decide if vendors first input their data and then choose the package or if they first decide for a package and then get to the form to enter their car. This is up to you and your preferences. To create a paid listing possibility for vendors, you now have to enter at least one car package in your WooCommerce products. Car packages are the listing options bought by your sellers. Therefore, navigate to Products → Add Product and set up the first listing option, the first car package. And the car listing duration (how many days a listing will be online). During the on-boarding process, you created the page “Submit Car”. 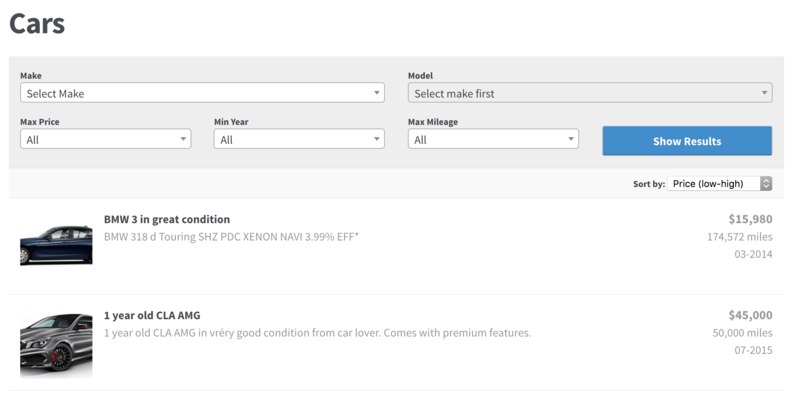 On this page, sellers can now easily follow the displayed form to list their cars. And afterwards (or beforehand, depending on your settings) choose the desired listing package. It is as easy as that. And as sellers and buyers are usually already familiar with online marketplaces, it should be an easy step for them to find each other using your website. As soon as there are some cars, your customers can search through them and get in contact with the sellers. So now, it’s up to you and your marketing, to create a flourishing car marketplace based on WordPress, WP Car Manager and WooCommerce. Paid Listings for WP Car Manager powered by WooCommerce. 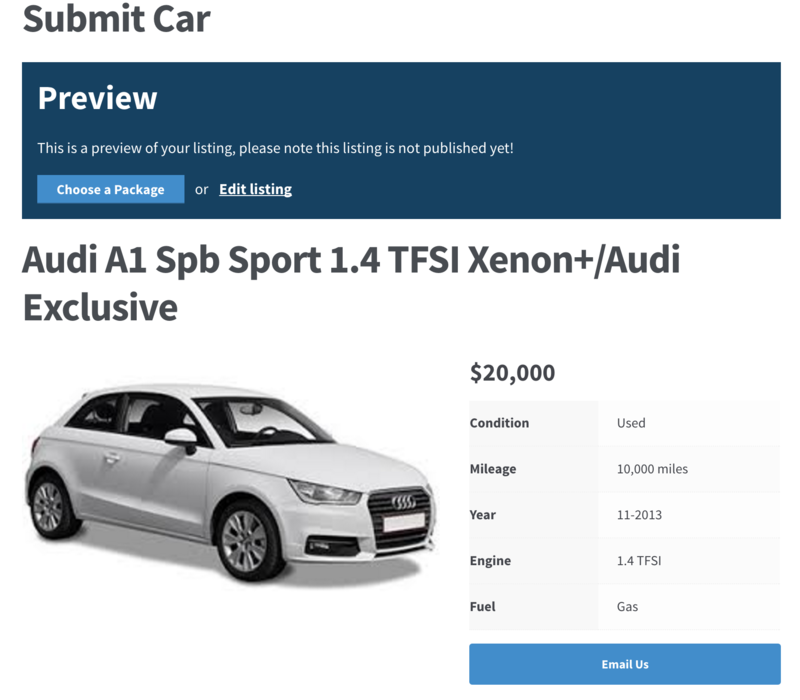 Setup purchasable car listing packages which can be purchased during frontend car submission. Requires the WooCommerce plugin. Thanks for the tips, I’ll be checking out WP Car Manager soon.